These healthier lemon bars are no-bake, gluten-free, vegan, naturally-sweetened and fully delicious. Plus they're topped with a fluffy coconut cream layer! this post is sponsored by bob’s red mill. thank you for supporting the partnerships that allow brewing happiness to grow and exist. xoxo. Lemon bars are one of my all time favorite desserts. They’re tart and sweet and creamy. So behind the scenes I’ve been plotting and planning this healthier version. But I had to get it perfect. I couldn’t put out a mediocre lemon bar, they’re too important to me. This week, I finally nailed it. I was so excited I posted a sneak peek in my Instagram story and WOAH. Who knew how many people loved lemon bars too? Apparently they’re kinda like a cult classic. What makes this version healthier, you ask? Well, the crust is made with just 4 ingredients – Bob’s Red Mill Oat Flour, medjool dates, coconut oil, and sea salt. It’s completely gluten-free and NO BAKE. All the yummy, salty/sweet crust you love and none of the baking time. Finally I topped it all off with a lovely coconut cream layer. This adds a totally dairy-free, creamy layer and really just caps off the perfect dessert. You’re gonna wanna make these, like, now. Add your pitted and packed dates to a small bowl, cover with boiling water and let sit for 5 minutes. After 5 minutes, drain and add to your blender or food processor. Add 1 cup of oat flour, coconut oil, and sea salt to your food processor or blender. Blend on medium/high until a thick, smooth paste is formed. You may have to stop the blender and scrape down the sides a few times to make this happen. Transfer the contents of your blender or food processor to a large bowl. Add in your remaining 3/4 cup of oat flour, 1/4 cup at a time. After each 1/4 cup, knead the flour into the paste, until a dough forms and the flour is incorporated. The dough will form a thick ball when all of the flour is mixed in. Line a square baking pan with parchment paper, and press your crust into the bottom of the pan. Use your hands to smooth it out evenly. Transfer to the freezer while you make your lemon curd layer. In a small pot, whisk together your lemon juice, maple syrup, water, and cornstarch. Once mixed, turn on the burner to medium-high heat and whisk until boiling. Allow it to boil without stirring for 1 minute. After 1 minute, add in your non-dairy milk and coconut oil. Whisk until well incorporated. The liquid should be thick at this point. Pour this liquid over your crust, and transfer the pan back to the freezer for at least 30 minutes. Meanwhile, open your cans of refrigerated coconut milk and drain out the clear liquid. The coconut should have formed a thick white layer. Scoop that into a medium sized bowl. Pour in your maple syrup and coconut oil. Whisk vigorously until everything is smooth and fluffy. Transfer to the refrigerator while your lemon curd finishes chilling. When your lemon curd has chilled for 30 minutes, use a spatula to gently smooth the coconut cream over your bars in an even layer. Sprinkle the top with coconut flakes. Cut into 12 bars and store in the refrigerator until ready to serve. Top with optional lemon wedges for garnish. When I was living with my sister and brother-in-law in Atlanta, I had a nice morning routine. I’d make my way down to the kitchen, pour myself some coffee, pet the dogs, and sit out on the front porch and read. After that I’d make my way back inside where my brother-in-law would read a daily wisdom from the book Tools of Titans before heading to work. It was a weird sort of bonding moment. We joked about becoming titans in our fields of work, but also took the advice to heart. Slowly but surely it became my favorite part of the morning. He’d flip the book open to whatever page he felt like had that day’s wisdom and read. One day he read a story about a man who was trying to teach his son to love rainy days. The man (I don’t remember who it was) talked about our cultural negative bias towards rain. We stay inside. We limit ourselves. We use the words “gloomy” and “dreary.” “What if,” he said (I’m paraphrasing), “we called them beautiful, rainy days instead?” What if we played in the rain? What if we changed our whole mentality and vernacular for what rain is to us? That quick morning reading has stuck with me for nearly a year. I think about it often. Mostly, in relation to literal rainy days, but sometimes I think of it in the larger, more metaphorical sense. The whole *turning lemons into lemon bars thing* or whatever. In New York I have my fair share of grey, rainy days to deal with. And I’m doing my best to retrain my brain to see them as beautiful. But it feels hard. Almost as hard as retraining my brain to see my body as beautiful. 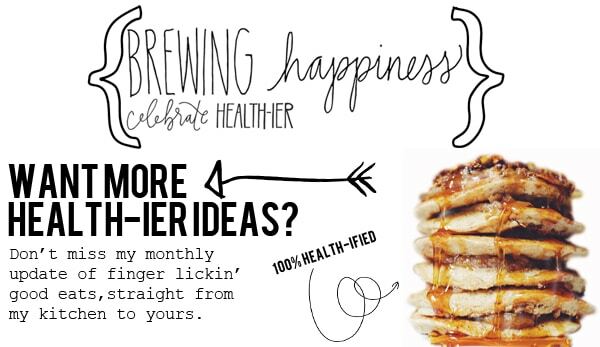 It’s why I started Brewing Happiness – I wanted to brew or create more happiness in my life. So I worked hard at it. I changed my food, my life, and eventually my mind. I trained myself to see the clouds as beautiful. These days, it is mostly literal clouds I’m talking about. Most of the metaphorical ones have dissipated. Now, I just spend my days sitting inside, watching the rain and eating way too many Healthier Lemon Bars. (So it’s not too bad.) I just try to remember that my words matter, my actions matter when it comes to my outlook. Positive words create positivity. And you have to get out of your routine in order to change the way you see and think. I’m just doing my best to remember that rainy days can be beautiful too. xo. I love how you added 0 eggs into the lemon curd! These bars look fantastic, well done! Thanks, Elizabeth! It was fun figuring out a healthier lemon curd. xo.